Rockland County NY health officials reported on the measles outbreak in an update today. 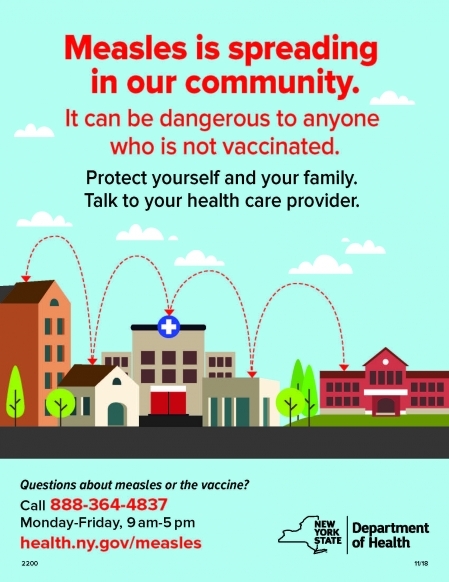 As of November 19, 2018, there are 75 confirmed reported cases of measles in Rockland County. At the end of September 2018, an international traveler arrived in Rockland County with a suspected case of the measles. Per protocol, the Rockland County Department of Health (RCDOH) was notified and immediately activated its Communicable Disease Team to investigate. There have been additional cases of measles from international travelers to Rockland, exposing more people to measles. People who are unvaccinated risk getting infected with measles and spreading it to others. These cases are presently clustered in eastern Ramapo (New Square, Spring Valley, Monsey), however due to Rockland County’s small geographic size, exposure to the measles may occur anywhere in the county. Children 6 months through 11 months of age get an MMR vaccine now. Getting an MMR vaccine now will help give them some protection against measles. They will still have to get a vaccine at 12-15 months of age and again at 4-6 years of age. Children 1 through 3 years of age who have already received their first MMR vaccine should get a second MMR vaccine now, as long as 28 days have passed since the first MMR vaccine was given to them. This second MMR vaccine will count for school entry. Any adult who has not received their first MMR vaccine yet should get their first MMR vaccine now. There may be medical reasons not to get the MMR vaccine, speak to your health care provider.